THE TROOP TRAIN had backed away from Clatteringshaws station, and was now out of sight. The men of the English Ninth Army were squatting on the heathery ground in a circle round Simon, waiting for him to address them. Dead silence was his answer to this. ‘What’s Wendish like, then?’ one of the men enquired. Rodney Firebrace spoke up. ‘Wendish is an awful language. It’s highly inflected – there are nine declensions of nouns—’ ‘What’s inflected?’ somebody shouted. ‘Are you all with me, then?’ called Simon. The men jumped up and started bustling about, picking up their arbalests and re-packing their hard-boiled eggs. In ten minutes the whole mass of them had drifted off down an eastward-facing valley (Rodney Firebrace had prudently brought a compass) and were out of sight of the station. Simon and Rodney walked alongside the lengthy, straggling column, talking to the men, telling them jokes and stories to keep their spirits up, and encouraging them to sing marching songs. So it proved, and the men of the Ninth Army marched eastwards in a gale of song. As dawn began to break, Simon decreed a rest for the Ninth Army. He reckoned they might have marched about half of the distance they had to cover. The men sat down and dug their way into the sacks of hard-boiled eggs donated to the army by kind ladies when the train stopped at Northallerton station. The track they were on clung to the side of a valley. Ahead, it curved round a hill. A grey parrot came flying from behind them, and alighted on Rodney’s shoulder. Simon, ahead of the others, rounded the bend on the road, then came to a startled stop. Ahead of them, on the other side of the valley, was the force they had come to fight. The track ran down, crossed a bridge, then rose again to where the foreign army was stationed, glittering red and gold, with the new-risen sun fetching flashes from muskets and shields, spearheads and musket barrels. They had horses. And small cannons mounted on wheels. And they out-numbered the English force by at least two to one. The cannons, which looked very impressive, were drawn by wide-horned oxen. Like the English army, the Wends had apparently paused to eat breakfast and water their beasts, which were being led in groups down to the river which ran along the valley bottom. The foreign force had now caught sight of the advance part of Simon’s army on the opposite slope. They could not see it all, because of the fold in the hillside. They could not see that they had the numerical advantage. A group of leaders, down by the bridge, were shaking their heads, obviously discussing the situation. ‘Look, here’s someone who wants to parley,’ said Firebrace. ‘I’m coming too,’ said Simon. Several of the group at the bridge fell back, leaving a tall rangy fellow in a steel helmet with wings, and a fat, compact little dark-bearded man in royal-looking clothes. That should have been better put, he thought. I’m no good at this kind of thing. Behind Simon, Firebrace muttered, ‘This is definitely a case for Canute and Ironside.’ Simon suddenly remembered about them. Father Sam had told him. ‘Quarter-staff or small-sword?’ said King Albert alertly. ‘Oh, certainly,’ said Firebrace. ‘My King will be delighted to take Your Majesty on at Hnefatefl.’ A Wendish gentleman-in-waiting was sent off at the double to the supply cart at the rear of the Wendish armed column. The board – a very handsome gold and leather one – was quickly brought and set out with its pieces on a handy tree-stump. The pieces were set out on the board. They were made of bone, and the king-piece, the hnefi, had a gold crown round his stomach. Two stools were brought from the Wendish camp for Simon and King Albert. They tossed a Wendish pfennig for colour, and King Albert won and chose white. ‘Ve play best of nine games, yes?’ said King Albert. ‘Very well,’ said Simon. I wish Dido were here, he thought. I bet she’d be good at this game. ‘Don’t play with a straw before an old cat,’ said the parrot. Massive Wendish baskets were used to carry arrows and bullets. Their contents were all tipped out onto the heather. While the two leaders had been playing Hnefatefl, a good deal of fraternization had been taking place among the troops. Simon’s army, who had been supplied with more hard-boiled eggs than they could use, had been happy to exchange these for the Wendish soldiers’ ration of little hard round blue-veined cheeses the size of golf balls, which were found to be very tasty by the English troops. When the vote was counted, it was found that three hundred men wished to remain in England. The rest preferred to go home. ‘Good! Some go, some stay. I go home now, to Vendland. You come, Simon, you visit me some time, we play more Hnefatefl. You play not bad, not bad at all,’ said King Albert. So the arrows and bullets were bundled back into the baskets, the eggs and cheeses distributed to those who wanted them, and the two armies prepared to go their ways. A large number of toads, who had been hesitating at the side of the road, now decided that it would be safe to cross. This entry was tagged 2016 and all that, Extract from Joan Aiken's last Wolves novel, The Witch of Clatteringshaws. Bookmark the permalink. This sequence put me in mind of the Mabinogion story of Rhonabwy, where Arthur has a board game with an opponent instead of a full-blown battle. If only all wars of aggression could be settled by a video game and sensible compromise — that’d be, literally, a gamechanger … It’s going to be hard waiting till I’ve read the inbetween novels before revisiting the Witch et al. All the stories are so much wiser…why do we forget them? “Why do we forget them?” I suspect that many haven’t read them to begin with, so forgetting isn’t even an option. Some Pogo may be just what we need right now. I’m going to dip into my Walt Kelly collection and try to feel better. 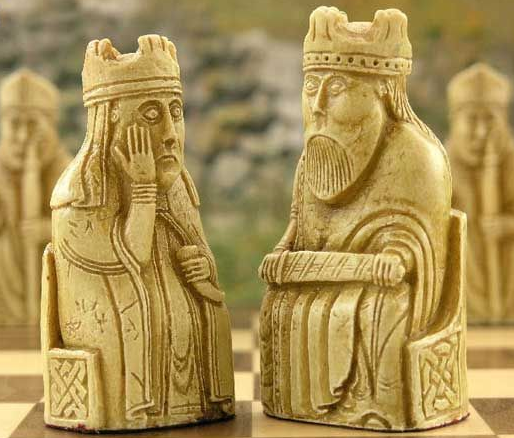 Also, thanks for the reminder of the link between Hnefatefl and the Lewis Chessmen. I’ve been researching 12th Century Scandinavia and learned about Hnefatafl, which the Norse introduced wherever they traveled (which was pretty far).